A convenient drop-off zone is available in Upper Halawa Lot section 1F for all ride share, taxi, and private vehicles. No entrance fee is required at drop off zone. 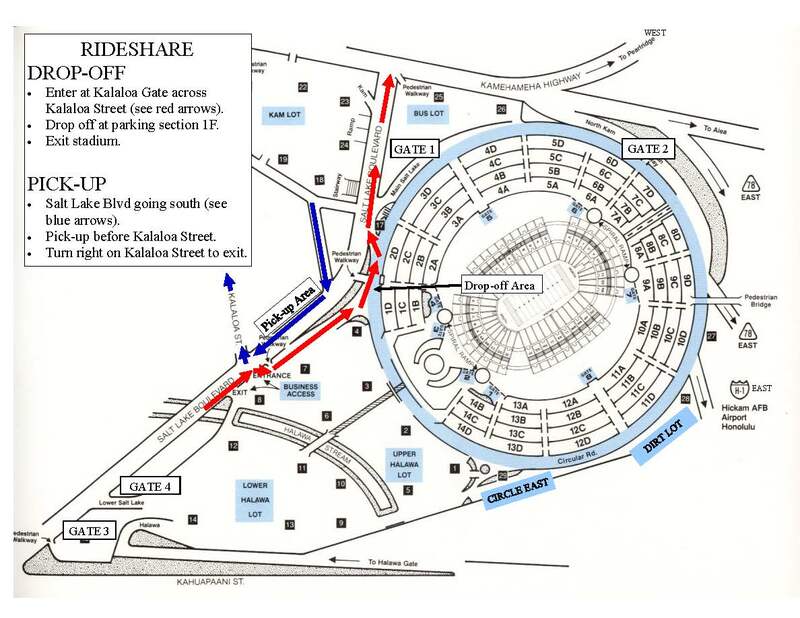 Vehicles enter through Kalaloa Gate and exit stadium parking lot onto Salt Lake Blvd through the exit gate. Do not drop off or pick up on Salt Lake Blvd. Patrons are encouraged to use the pedestrian cross walk and have drivers pick up before Kalaloa Street. Drivers use Salt Lake Blvd south bound lanes across the stadium. Do not use north bound traffic lanes to pick up. Cars will be exiting out of Main Salt Lake Blvd Gate 1.